You cannot help but be awestruck by the immense size of the known universe. The picture heading this post is the Milky Way, the galaxy in which our Solar System revolves. 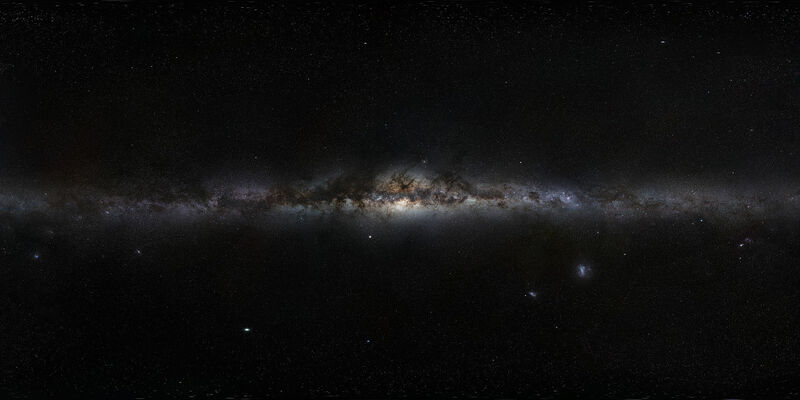 The Milky Way has a diameter of about 150,000–180,000 light-years, and contains 100–400 billion stars. At the center of our Solar System is one of the stars, and it is 27,000 light-years from the Galactic Center. The Milky Way is immense in size, yet it is just one of numerous galaxies, as the known or observable universe contains as many as 200 billion galaxies. There is also the Unknown, but that cannot be known, for it is the place only Brahma knows, and it does not change. There is One Creator of Everything; so therefore, there is only one true path for one to walk. Upon the earth today are countless spiritual and religious practices with very different ways. The practices are not stable, but always changing, and that is different from the Holy Teaching of the Creator, because the Holy Path does not change, no matter where a living being resides in the vast universe. It seems like we of the earth would be lost to the Creator and Sustainer of the Universe in the vastness of space, but such is not the case. The Holy Spirit Pervading the Universe comes to every living being with the living breath. The breath comes to us with love and upon the stream of air is the Holy Teaching. Many thousands of years ago, when Enlightened Beings roamed the earth, Brahma was able to teach through them. The Enlightened had many names like Rishis, Buddhas, Messiahs, Magians, Adityas, Serpent Kings, and so on, and they would sit in silent meditation, and the Supreme Teacher would present the teaching utilizing the breath held within. The teaching that was heard became part of the Oral Tradition, which was eventually written down, and today, we have the very text of the Holy Words. Rigveda is a Sanskrit word that means the Sacred Text of the Sacred Knowledge, so Rigveda refers to a particular Sanskrit spiritual text, and every ancient spiritual text on the earth. The Rigveda, the Brahma Sutras, Yoga Sutras, Shrimad Bhagavatam, Mahabharata, and so on, are Rigveda because they contain the Sacred Text of the Sacred Knowledge. All of the ancient Sanskrit Texts are the same, as well as the Pali Texts, the Avesta, the Aramaic and Hebrew Texts of the Bible, the Arabic Text of the Quran, hieroglyphics on walls of Egyptian pyramids and Mayan Temples, and so on. The Sacred Knowledge is available through many sources, but is not known today because it has been lost in translation. The translation of all of the ancient spiritual texts to modern languages is a sham. The major error is that the translators have taken the Sacred Text to be a common language. Consequently, the books considered most holy to the various earthly religions are but a common translation. The Holy Text says something quite different from what is currently in print. When the texts are translated as a Sacred Language, they are found to share an identical philosophy because their source is identical. Every verse teaches the Holy Path to walk to overcome the suffering of the earth, and the meditations to rise above to be with in heaven. All of the ancient spiritual texts on the earth are the Guidebooks the Creator of Heaven and Earth has given us to be happy, and we have been given a vast playground of the universe to enjoy. When the Rgvedaschool discovered how to translate the Rigveda, it discovered how to translate the Arabic Text of the Quran, the Hebrew and Aramaic Texts of the Bible and so on. Interestingly, the school translates all the ancient spiritual texts in exactly the same way utilizing the same dictionary, and miraculously, the same philosophy. The philosophy has many names, such as the Philosophical System of AH, the Good Path to Good Fortune, and so on, and the teaching is meant to be available to everyone, to enjoy living in this awesome universe. In this universe, the teaching is consistent, to be kind and helpful to all living beings, so the deer and the fox can enjoy playing in the field with the children. Here is a verse from the Veda about obtaining the love of heaven for sharing upon the earth. For the wind and the knowledge to come from the Leader to most cheerfully lead.